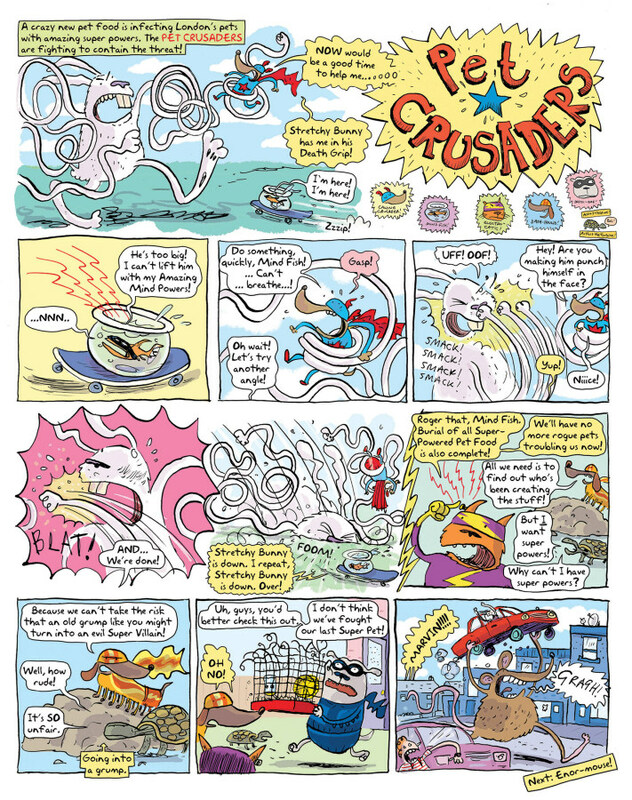 Moose Kid Comics –Jamie Smart’s proactive statement that there’s still plenty of life in comics for kids – debuted last week to overwhelmingly positive critical acclaim. A reaction to the demise of venerable UK weekly comic The Dandy, Moose Kid Comics features around forty creators from established names in comics for children through to the cream of the small press scene, and includes names like Gary Northfield, Sarah McIntyre, Neill Cameron, Mark Stafford, Rachael Smith, Jess Bradley, Viviane Schwarz, Joe List, Roger Langridge, Tom Plant, and many others! BROKEN FRONTIER: The days of popping into a British newsagent and seeing countless weekly comics to choose from on the shelves are long since gone. Apart from licensed properties (and plastic toys with a magazine stuck on!) we are now essentially down to The Beano and those places that stock The Phoenix. To what degree is Moose Kid Comics a reaction to the marginalised state of affairs that print comics for kids in the UK find themselves in 2014? How would you define its “mission statement” so to speak? JAMIE SMART: We started the idea of Moose Kid Comics when The Dandy announced it was going out of print after 75 years. It was very apparent to both readers (new and nostalgic), and artists, that this was more than just a title disappearing, this was a cultural shift. The end of an era. There was a lot of discussion online about what could be done with it, how we should refocus our efforts to get kids reading comics, to contribute towards the next generation of comic artists. I wondered if the answer lay in the artists doing things for themselves, making their own opportunities. After all, with the rise of the internet, webcomics and self-publishing, artists have really begun to seize more control of their own careers and audiences. So it made sense that as artists we should be making the comics we think should be out there, with no thought given to demographics, business plans, distribution, focus groups, all the things that could make a comic tired and stale before its even begun. To build the thing first, and then work out the details later. 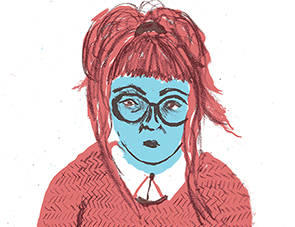 We’re 36 pages long, with 40 artists, and a real variety of artists too. Our focus is ridiculous, silly, hilarious characters, for everyone to enjoy (whatever age, gender etc., etc.). We made it digital, and free, so everyone could see what’s achievable. Don’t get me wrong, I love some licensed titles, I’m not suggesting we get rid of them and only have original content comics on the shelves. I’m saying there’s a place for everything, we need that variety, but original content titles are in the minority. And when you look at the next shelf up, with a billion titles about which D-list celebrity is too fat, or having a twitter war, or was too fat but is now too thin, that’s an insane state of affairs to be in isn’t it? Where we value and invest in that kind of content, instead of original, fantastical, exciting stories and escapism? BF: Do you have any thoughts on why the availability of kids comics in the UK have declined to the extent they have in recent years? There’s no doubt that we have incredible talent in that area here yet while graphic novels aimed at a more adult audience have never enjoyed such a renaissance the kid-oriented end of the market still seems to struggle. SMART: A lot of the argument is that kids have drifted away from traditional comics because of technology, internet, iPads, whatever. While these things certainly contribute, I think it’s a real myth to pin the blame there. 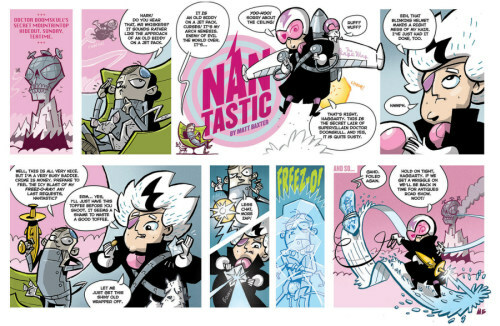 For one, mainstream kids comics were kind of slow in embracing new technologies – print and digital can totally live in tandem and be symbiotic for each other – so possibly got a bit left behind. And the fact is, if you talk to any artists who do comics workshops in schools, they’ll tell you the same thing: kids LOVE comics. That hasn’t changed. What’s changed is they’re just not as exposed to them as much culturally anymore. So a lot of children don’t even know how to read a comic, let alone where they’d get one from. Children’s comics have been allowed to very slowly slide out of our national consciousness, as the last great generation of children’s comic readers in the 80s and early 90s then grew up and perhaps didn’t bother introducing their own kids to comics. It’s wonderful seeing how well more grown-up comics are doing, this really feels like a great time to be making comics, but yeah I totally agree that kids comics are being forgotten about, and if we stop engaging with children, and stop trying to reach out to new, non-comic reading audiences, then that would be a real tragedy. 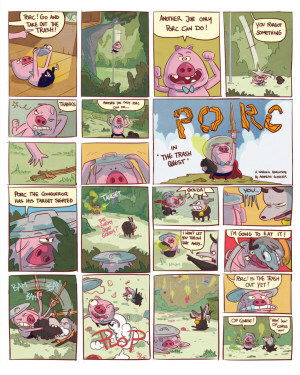 BF: Moose Kid Comics has a quite wonderful metafictional central plot running through it. For those yet to download their copy can you tell us a little about that core concept and the sort of characters they can expect to meet in the comic’s pages? SMART: If you ever think about Justice League, your brain probably first pictures Superman. If you think about The Simpsons, you possibly first think about Homer (or Bart). This was my thinking behind the Moose Kid concept, that a central character lodges in your brain far stronger than a more overarching anthology name. I talked to a few people about this, I was worried if I created a character and put him on the front, people might think I was trying to claim this comic as my own. But my emphasis was really on giving readers a hook, someone to associate with from the very start, someone to spring up in their minds immediately if anyone mentions ‘Moose Kid’. Alongside this, I wanted to make sure we weren’t just slapping a load of different comics together and expecting readers to go with it. 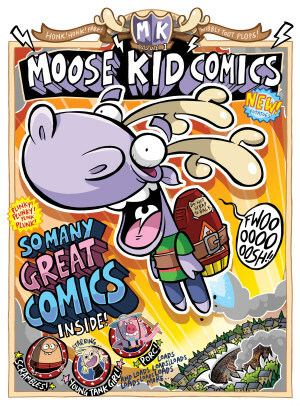 I wanted Moose Kid to be a character who gets sucked from the real world right into comics, so he runs around all hysterical and delighted about being stuck inside the comics he loves so much. Not for him to physically intrude on anyone else’s work, just for him to be a side note on some pages, someone to carry the audience along with him. And finally, I wanted an authority figure, who wanted to spoil all our fun and who the readers could rally against. That’s where the wizards come in, they zapped Moose Kid into the comic in the first place, but now want to haul him back out and shut the comic down. So they run around in there too, determined to stop everyone having fun. As a kid, I loved comics with some kind of killjoy bad guys trying to ruin the buzz. It makes you identify more with what you came here for. BF: You’ve gathered together a huge band of creators from all walks of comics in the UK. How did you go about recruiting artists for the project? SMART: I put a call out online about a year ago for a show of hands, who would be interested in theory. We got hundreds of responses, which reassured me this was a good idea to keep going. I also had a wish list of artists I wanted involved who I approached directly. It’s hard to convince some artists to join a project when they haven’t seen anything of it, they’re doing it for free, they don’t know if it’ll work out. So I was delighted to get who we got, and maybe we can get even more artists for the next issue. BF: One of the aspects of the first issue that delighted me – as a champion of small press and self-published comics here at Broken Frontier – was that mix of established names from UK kids comics like Gary Northfield (below right) and Sarah McIntyre with creators more usually seen in the small press arena like Steve Tillotson, Rachael Smith and Joe List. Were you looking to pull talent from as wide a creative pool as possible and not just the obvious stars of The Beano, The Phoenix and The Dandy? SMART: I tell you what, Twitter has a lot to answer for. It’s really helped the british comic industry pull together into a closer circle and keep in touch with what everyone’s up to. Thanks to Twitter I’ve discovered and become friends with so many brilliant artists, and seen work I otherwise might never have. It’s important to note though I wasn’t trying to specifically find x number of artists from indie comics, x number from 80s comics, there was no conscious effort to select artists like that. The only thing I was looking for was a style and wit which fitted into our ethic, which is a tricky thing to explain when you’re saying ‘thanks for getting in touch, but no thanks’ to a brilliant artist. I knew the thread I wanted running through it all, and we were lucky enough to have some amazing artists to choose from. BF: Whereas The Phoenix is a serial endeavour you seem to be embracing a more shortform story structure with Moose Kid Comics, in the style of old favourite weeklies of the Buster and Whizzer and Chips variety. Were you consciously looking to create something that was more gag-based than narrative-based for the comic? SMART: Definitely. What The Phoenix does, it does SO well, but there’d be no point trying to emulate that. We wanted a line-up of comedic characters, the sort you’d see on Nickleodeon or Cartoon Network, all original content and owned by the creators. I wanted the stories to be quick slaps in the face then straight onto the next one, comics you could pick up and put down and dive into at random. Comics you could read again and again without particularly needing to know what happened before. 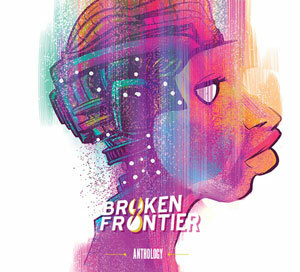 BF: The first issue is available free online. Was publishing via a digital platform a reflection of the direction in which you feel comics are going in the future? Or do you have future plans for possible print editions? SMART: I mean, there’s obviously a big digital comics industry now, but it’s not like we were saying ‘yes this is the future let’s all do this now’. I still 100% believe in printed comics, I way prefer them to digital, I want them to keep going forever. What publishing digitally gave us was absolute freedom to just make our comic and show as many people as possible, without needing to consider the intricacies of distribution or funding the printing costs. It gave us the platform to make our statement. We’d definitely love to do printed copies, past of the initial priority was to somehow fund a print run to give printed copies out for free to schools, hospitals, etc, places where kids can really do with a laugh. It’s just finding the generous benefactor or the time to run a Kickstarter, that’s the issue. BF: One of the big surprises for many in #1 will be the inclusion of Young Tank Girl by Alan Martin and Warwick Johnson-Cadwell. How did that all-ages version of everyone’s favourite violently slapstick heroine find her way into the pages of Moose Kid Comics? SMART: Alan actually got in touch with me some time ago because his son liked my work in The Phoenix. I was really chuffed to hear that, since Tank Girl had been an absolute bible to me all through art college, a real inspiration. So I drew his son a picture and, quite cheekily, asked Alan if he’d like to be involved in my Moose Kid project. I said he could do whatever he liked, but he immediately suggested Young Tank Girl with WJC, a prequel of sorts to Tank Girl. That was a pretty mind-blowing idea to me personally, as much as for the project. I should say though, it was important that it be suitable. You can’t just put something in for the sake of a personal buzz, it had to be right for the project. But the script Alan showed me was just wonderful, really right for our audience and true to the spirit of Tank Girl, and then Warwick’s designs nailed it. I’ve drawn grown-up comics and children’s comics, and often get asked if the two are awkward bedfellows. But I’ve never seen any issue with it, all that matters is the content you’re producing right there, right then, for the reader who’s reading it. BF: What has reaction been like so far to the comic? Especially from children? SMART: Really amazing. I secretly hoped we’d get a good response, of course, there’s been a lot of goodwill about it before we even launched, but I didn’t expect it to go so well. I had a lot of emails on launch day from parents who said “I’ve read it and I love it and when my kids are home from school maybe I’ll even let them read it”. A lot of emails from kids saying it’s the best comic ever and when’s the next one. And some interest from publishers too, there are certainly some conversations we’re going to need to have. 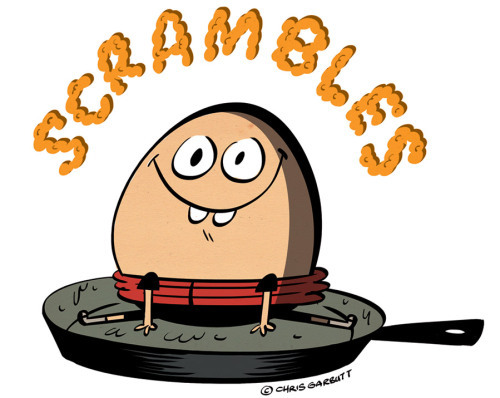 BF: What are your plans now for the future of Moose Kid Comics? What’s the next step in this great publishing adventure? SMART: Well that’s just it, we have options. I think we have to do a second one, the reaction to the first has certainly shown there’s a real thirst for funny, original children’s comics. But how we do it is up for grabs. As I mentioned, we need to chat to a few publishers. That would be ideal, if we could find the means to get it out there, both on paper and digitally simultaneously, and pay the artists, and reach audiences we otherwise wouldn’t be able to reach. I of course understand the amount of faith which needs to go into any new publishing venture, so it’s going to take time and work to get it right. Otherwise we could do an issue #2 like we’ve done issue #1, free and for the love of it. We could investigate Kickstarters to fund it, but running a successful Kickstarter is a whole project in itself, let alone making the thing afterwards, and I’m a little worried about how much time I can give to that. Not to mention the costs, just posting out a printed copy could be at least five quid just locally, let alone around the world, it could all get a little tricky. So, we’ll see. I want the dust to settle a little bit, so we can take stock of this great reaction, and then plan our next move from there. Whatever happens I think we have really proved our point, and shown what can be done. One of my biggest reliefs, too, was that the artists involved all liked the end product. That’s part of what drove me to spend so much time on it, not wanting to let anyone down. Hopefully from here we can really make a difference. You can read or download Moose Kid Comics for free here. For more on Jamie Smart’s work check out his website here. Thanks Bart. Great to see projects like this that affirm the sense of community in UK comics at the moment.